It’s recorded all over this website that, on two occasions in our younger years, we made the journey between Hunstanton and Cromer on foot via the North Norfolk Coast Path. We also happened across a very nice little extension – or prequel, if you prefer – of seven miles starting at Snettisham beach car park and taking you right into Hunstanton and onto the official start of the trail. We found this on a day when we had been intending to visit Castle Rising – but left it far too late and saw the flag being lowered just as we pulled into the car park. Feeling a little crestfallen, we had to think of something else to do, quickly, that would make the long drive worthwhile. And thus, with marvellous serendipity, we found this excellent walk. Well, now things are looking very exciting at the other end. We’d visited Cromer at Christmas 2013 in order to take part in the excellent Boxing Day Dip – that’s when a large crowd runs enthusiastically into the sea in the latter part of December, shrieks loudly and runs straight back out again. 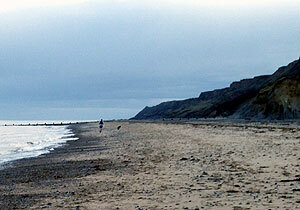 Part of that is an optional run along to Overstrand on the beach and back along the cliffs. We didn’t do the whole thing – nerves, knees and a nasty stumble that left one of us covered in blood, just what you need prior to immersion in salt water. Anyway, this was serious unfinished business. And so it was that, in the summer of 2014 we were on holiday in Norfolk and looking to walk from Cromer to Overstrand and back (in the event, we did it the other way round, but that’s not the point right now). What has appeared during our absence? Nothing less than a series of coast path extension signs and waymarks pointing east. On one level this feels like a bloody cheek, frankly. We’ve walked the coastpath! Twice! Who is moving the goalposts? But on another it’s great – we can’t wait to get the boots out and walk the outstanding 19 miles to Sea Palling (we’re claiming the two to Overstrand on our existing total, thanks). According to Sources on the Internet, this isn’t the end of it either. We can look forward to further extensions down to Hopton next year, and the unsatisfying stretch between the Beeston Bump and Cromer, where the path cut inland to divert round a world-class crop of caravan paths, has been re-routed down the coast. That bit might well be worth another look too. It also solves the problem of the path just petering out, which is what it used to do – twice we wandered into the town thinking: “Is this it? Where are the brass bands, the welcoming committee, the thrown bouquets and the celebratory bottles of fizz?” Both times we decided officially ending the walk on the pier was the only possible thing to do. So, what’s the path like as far as Overstrand? The clifftop section is more like slogging through dunes than your average high-level walk. It skirts a large golf course with some truly vicious bunker designs and is very well-organised and waymarked. There’s lots of parking at the Overstrand end and this is an excellent start-finish point. About a third of the way from Cromer, and two thirds of the way from Overstrand, there’s a steep but manageable path (handrails, steps etc.) 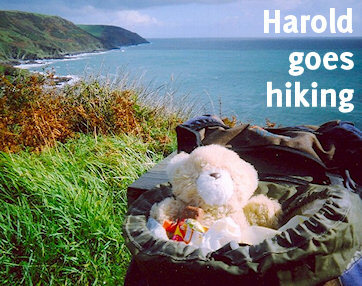 linking the clifftop with the beach in case you’ve regretted your choice and route. The route enters/leaves Cromer on a pleasant tarmac path with clifftop cottages which runs through North Lodge Park and down onto the Esplanade. Magificent views of the pier abound. The beach is, of course, beautiful, wide and sandy, although you need to keep an eye on what the tide is doing. Consult the Eastern Daily Press if you’re planning to walk it, as that should carry daily tide times for Norfolk. We managed to stay on firm sand for most of our walk. There are also a few interesting geocaches around, which always adds to things. Already I’m plotting how we might get back to do the extra stuff… Watch this space. Categorised under Great walking locations, Long walks, Short walks, tagged under beach walks, cliff walks, Cromer, Norfolk Coast Path, Overstrand.